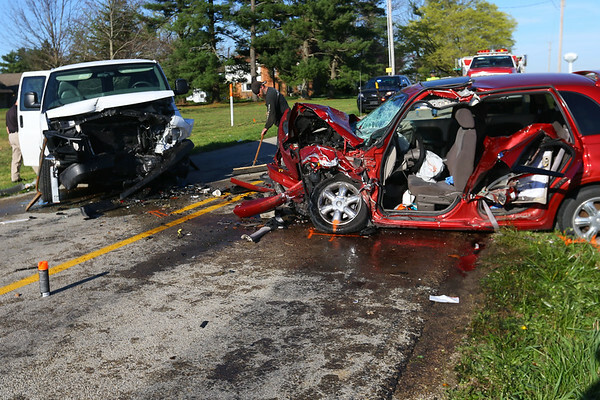 Three people were air lifted to the hospital from a Miami County accident on April 18, 2017. Around 8 a.m. Tuesday morning a call came out for multiple injuries in an accident at 800 South and Angling Road. Six passengers in a Miami Correctional Facility van, along with the 2 drivers were taken to hospitals. The driver of the PT Cruiser sustained serious injuries. The PT Cruiser was heading east and the van was heading west. The PT Cruiser crossed the yellow lline causing the driver of the van to try to go around the car on the wrong side but then when the PT Cruiser attempted to correct and the van did the same they struck head on in the middle of the road.